The possibility of Singapore having a non-Chinese prime minister was raised at a dialogue yesterday. Deputy Prime Minister Tharman Shanmugaratnam believes it is just a matter of time before the country gets "a minority prime minister - Indian, Malay or Eurasian or some mixture". "We've got a meritocracy; it is an open system. It is just a matter of time," Mr Tharman said, noting that the common space shared by Singapore's races was growing. But, he was quick to add: "Let me say I am not interested." He was speaking at a session chaired by Washington Post columnist Fareed Zakaria at the SG50+ conference organised by the Institute of Policy Studies and the Lee Kuan Yew School of Public Policy. At a later panel, Ambassador-at-Large Tommy Koh asked Emeritus Senior Minister Goh Chok Tong if a Malay could be elected president. Mr Goh said it might be difficult, but added that "if good candidates came along... the time will come when the Malay candidate would be elected". 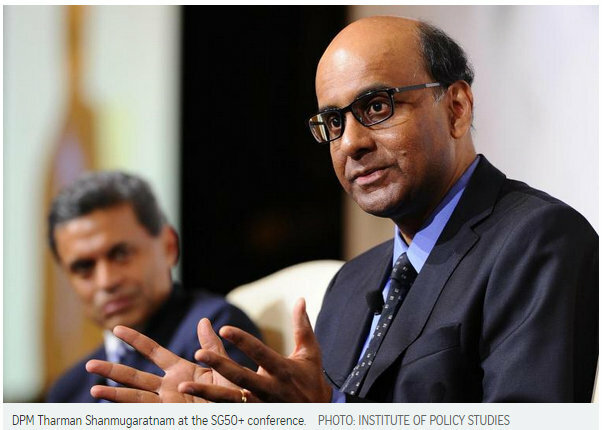 AFTER 50 years of nationhood, it is a matter of time before Singapore sees a prime minister from an ethnic minority, Deputy Prime Minister Tharman Shanmugaratnam said on Friday. "It is inevitable that at some point, a minority prime minister - Indian, Malay, Eurasian, or some mixture - is going to be a feature of the political landscape because we have meritocracy, it is an open system, it is just a matter of time," he added. Mr Tharman, who is also Finance Minister, was responding to a question from Washington Post columnist and CNN host Fareed Zakaria on whether Singapore could see an Indian prime minister. Mr Zakaria was chairing the lunchtime dialogue at the Institute of Policy Studies' SG50+ Conference, to discuss what lies ahead for Singapore. In response, DPM Tharman said he's not keen on the job, but added that it was inevitable that Singapore will have a minority Prime Minister. "Singapore is evolving, the common space that everyone is growing up in is much larger than pre-independence or even in our early decades," he said. "It is a pretty strong common space, an education system where everyone is educated, first language English. You go through common experiences together, National Service, so it is a matter of time." When probed by Mr Zakaria if he would not serve if he's been selected, Mr Tharman drew a sporting analogy. "Let me put it this way, we all have our preferences. And I was always, in sports, a centre half rather than centre forward. I enjoy playing half back and making the long passes, but I am not the striker," he said. "Unless I am forced to be, and I don't think I will be forced to it, because I think we have got choices. It is not bad that we think so hard about succession, and we don't always get it the way we expect it to be, but we think very hard about succession in Singapore." "And I think we have a crop of people who are in the fray and entering the fray who will provide future leadership," he added. The question of whether and when Singapore might see a minority prime minister has cropped up from time to time. Days after United States president Barack Obama was elected, becoming the first black president, Prime Minister Lee Hsien Loong was asked whether Singapore was ready for a non-Chinese PM at a dialogue with Malay-Muslim community leaders. Mr Lee said he thought it was possible for Singapore to have a non-Chinese PM. But, he added: "Will it happen soon? I don't think so, because you have to win votes. And these sentiments - who votes for whom,and what makes him identify with that person - these are sentiments which will not disappear completely for a long time, even if people do not talk about it, even if people wish they did not feel it." He also acknowledged that attitudes towards race had shifted in the last two to three decades as English provided more of a common ground, but said to get to "a position where everyone is totally race-blind and religion-blind, I think that is very difficult. You will not find it in any country in the world." Speaking at the SG50+ conference, DPM Tharman Shanmugaratnam says the Government wants to preserve a culture where it keeps thinking long-term and rolls out sustainable policies, in the interest of the people. Deputy Prime Minister and Finance Minister Tharman Shanmugaratnam has said that as Singapore looks towards the future, the Government will need to focus on planning for the long term, and holding a strong centre in society. He said this on Friday (Jul 3) at the SG50+ conference organised by the Institute of Policy Studies and the Lee Kuan Yew School of Public Policy. As Singapore celebrates 50 years of nationhood, it is not only taking stock of the past five decades, but also looking ahead. And as society evolves, DPM Tharman said that changes must be viewed with an open mind. But at the same time, the Government must focus on holding the centre strong. "You must have that culture starting from very young, pre school, primary school, where kids speak up. You don't need to always make sense, you don't need to speak logically, but you've got to have a mind of your own. There’s something to it. I believe in that. What it implies for political culture and systems - you need some humility on this." “I think we should keep our minds open as to how this will evolve. We can't decide how, 30 or 40 years from now, our politics will be. We can't decide in advance. But we have a very good reason, based on our history and our sense of the reality we operate in, that we do need a system where the centre holds strong. "And the centre doesn't hold strong because of the invisible hand of society. Quite the opposite. The invisible hand of society tends to pull things away from the centre. It holds strong because you've got a Government elected by people that works to keep it strong." DPM Tharman also said it is important for the Government to be able to plan for the long term. "There is a sense in which if your vote goes down significantly, any Government will tend to focus more on the short term than the long term. That's a reality of politics all over the world. Certainly, the current Government wants as much as it can to preserve a culture where we keep thinking long-term in the interest of people. Because it's fairer. “It's much fairer to tell people that it's not just what we can give today, but what we can sustain in future. And the societies that haven't done that end up hurting the poor and the middle-income groups. That’s the reality of it. It's not just about inter-generational equity, about the old versus the young. It's also about the rich versus the poor. Because it's the poor who suffer when you're unable to sustain the welfare policies that you start off with." AN INDIAN PRIME MINISTER FOR SINGAPORE? DPM Tharman also fielded a question on whether Singapore will have an Indian Prime Minister. "It seems to me inevitable that at some point, a minority Prime Minister - Indian, Malay, Eurasian or some mixture - is going to be a feature of the political landscape because we've got a meritocracy. It's an open system. It's just a matter of time. “The common space that everyone is growing up in is much larger than it used to be pre-independence or even in our early decades. It's a pretty strong common space. There's an education system where everyone is educated with a first language, English. You go through common experiences together, National Service. So it's a matter of time. “We all have our preferences, and I was always in sports, centre-half rather than centre-forward; I enjoy playing half-back and making the long passes, but I am not the striker unless I am forced to be. And I don't think I'll be forced to it because I think we've got choices." Even as the nation look towards the next 50 years, DPM Tharman said that there is already a crop of people in the fray, and entering the fray, that will provide future leadership for Singapore. The Republic’s educational system has served the country well in increasing social mobility, but it will also have to evolve to spur innovation and create a sense of individuality among Singaporeans, said Deputy Prime Minister Tharman Shanmugaratnam yesterday. Speaking at a dialogue session during the SG50+ conference organised by the Institute of Policy Studies, Mr Tharman, who was Education Minister from 2003 to 2008, said he “makes no excuses” for what the system had done to uplift the Singapore population. “But that spirit of individuality, that free play of the mind, isn’t best developed in a system that is highly competitive and focused on tests,” said the minister. He was responding to a question from American journalist Fareed Zakaria, who chaired the session, on whether Singapore needs to shift away from a system of testing to encourage creativity. Mr Tharman said: “The toughest question to ask ourselves … is not what we add to the education system, but what we subtract.” He pointed out that the task “requires some courage”, given that Singapore is doing well, including in international tests. Nevertheless, there is a need to make room for experiences outside the curriculum, such as the time to reflect, explore and build fellowship with others, he said. “We’ve got to take something out, accept that there is going to be a trade-off, we are not going to be as good in certain things. But we’ve got to provide that space and watch it as we go,” said Mr Tharman, who noted that Singapore is starting from a strong foundation in education. He added that having a sense of individuality is not at odds with having a sense of fellowship as one grows up with people from different backgrounds. Dr Zakaria noted the importance of instilling in people a “sense of challenging authority”. “Is it not tied with a political system that does not encourage dissent either?” he said. In response, Mr Tharman agreed that there must be a culture “starting from young, pre-school, primary school, where kids speak up”. Noting that the Swiss culture is different from the American culture, Mr Tharman said there are very strong social norms in Switzerland and its people have very deep respect for one another. “You don’t create noise beyond a certain hour at night, you don’t make life difficult for your neighbours ... there’s a certain sameness about us (Singaporeans),” he said. Dr Zakaria referred to how the United States had fared poorly in international academic tests, but is highly innovative as a country. However, Mr Tharman noted that the success stories in the US had come from a small portion of the population, who typically had gone to private schools and Ivy League universities. While there is inequity in the American public-school system, Singapore focuses on meritocracy to give everyone a fair chance of success regardless of his background, he said. Still, Mr Tharman recognised the need for a new culture and new set of skills for Singaporeans to spur innovation, as the Republic moves into its next phase of development. The younger generation is already showing greater willingness to venture into the unknown, he added.